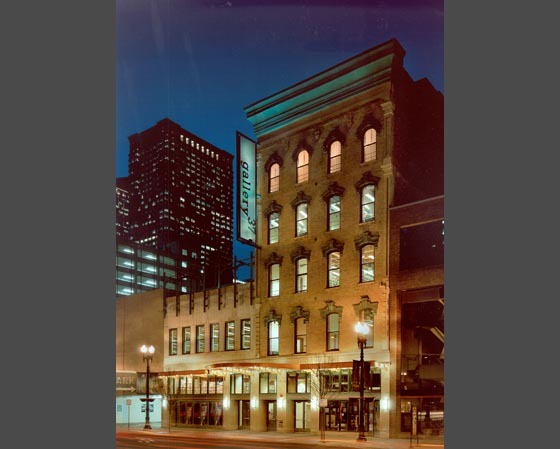 Set within the Theater and Arts District along Randolph Street in Chicago's North Loop these two, formerly vacant and deteriorated buildings dating from the 1870's and 1930's have been fully adapted and renovated to be a vibrant hub for the arts. The City of Chicago purchased the buildings for reuse by the Department of Cultural Affairs. After consideration with the it was determined that the buildings should be combined and adapted for use as a multi-faceted visual and performing arts center for education, administration and presentation purposes of the City's year-round Gallery 37 Arts Education Program. The multi-use arts concept evolved, and the finished building contains various studios for painting, drawing, sculpting, and even animating with computer graphics as well as studios for dance and music. Enriching street life and making a connection to the surrounding Theater and Retail district, a Storefront "Black-Box" Theater, a Shop for selling art created by the students, and a Café to serve the student-prepared culinary fare are all located at street level. An upper level Art Gallery exhibition space and an exterior roof level Sculpture Terrace were also created.